Copyright © Boatman Geller. Images used with permission. 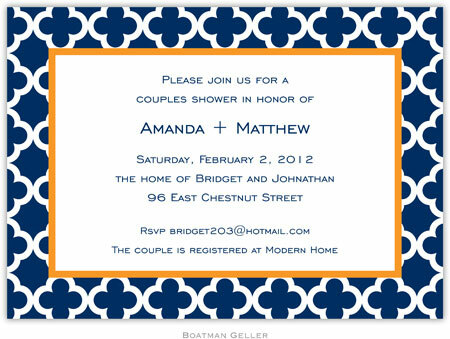 Completely customized invitations, perfect for use as birth announcements or invitations. You choose the colors for the pattern, another color for the inner border/accent and an ink color for the text. Choose typestyle(s) and specify your text - and you have created your very own masterpiece! Engravers Gothic shown. Choose up to 2 of any of our available typestyles and dictate where they are used. Navy shown. Choose up to 2 of any of our available ink colors and dictate where they are used. Folded note, perfect as a thank you note or everyday stationery. The color choices used on the birth announcement/invitation will also be used on the thank you note. Blank white envelopes are included with the cards, and can be printed with up to 3 lines of text (in your choice of typestyle and ink color) for an additional fee. Rush Processing available which shortens production time to 3-4 working days (after proof approval, if applicable). Text should be entered without skipping lines. Any blank lines desired should be explained below. Do you want Envelope Linings? what is the form for the Initials? Do you want Envelope Linings for the Thank You Notes? If yes, which envelope lining? Any Printed TY Note Envelopes?